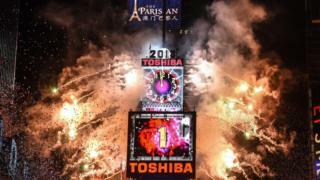 A camera-equipped drone will watch over New Year's Eve celebrations in New York City, the NYPD has confirmed. It is the first time the force has used a surveillance drone to monitor the annual party in Times Square. It declined to elaborate on its counter-drone measures, but said visitors to the city should leave their drones at home. The drone will let police move the camera to a point of interest with "greater rapidity", the NYPD's John Miller said at a press conference. However, officers declined to say how many camera drones would be deployed. Image caption Police Commissioner James O'Neill said the drone would be "this big"
More than a million people are expected to celebrate New Year in the area surrounding Times Square, where the annual "ball drop" on top of One Times Square will take place. In addition to the drone, the NYPD said it would deploy thousands of cameras, officers and other security measures to keep party-goers safe. "You will see a lot of officers with a lot of gear and long guns," said Police Commissioner James O'Neill. He also urged the public to remember the "see something, say something" campaign, and to report anything suspicious to police. "That's not just a slogan... in fact, attacks have been stopped because someone said something. Lives have been saved because someone said something," he said. "If something doesn't feel right, you've got to tell an NYPD officer." However, he stressed the measures were precautionary and said police had not received any credible threats of disruption.